Meaningful work is not easy. There are many terrible people in society. They are dirty and do not want anyone to look cleaner than them. They do not want anyone to become a lotus. They want to pull the lotus into the mud. But they are not able to succeed because the lotus will become a lotus! Around Trinh Hoi are several people who understand you, sympathize with you, admire your soul and great heart. If it wasn’t for you, who would help the suffering victims? I am one of the people who recognize your hard work. My check is very small compared to the amount VOICE needs, but it comes from the heart of a lady at 84 years old, with a small retirement (only 650 usd/month. I do not ask for SSI). 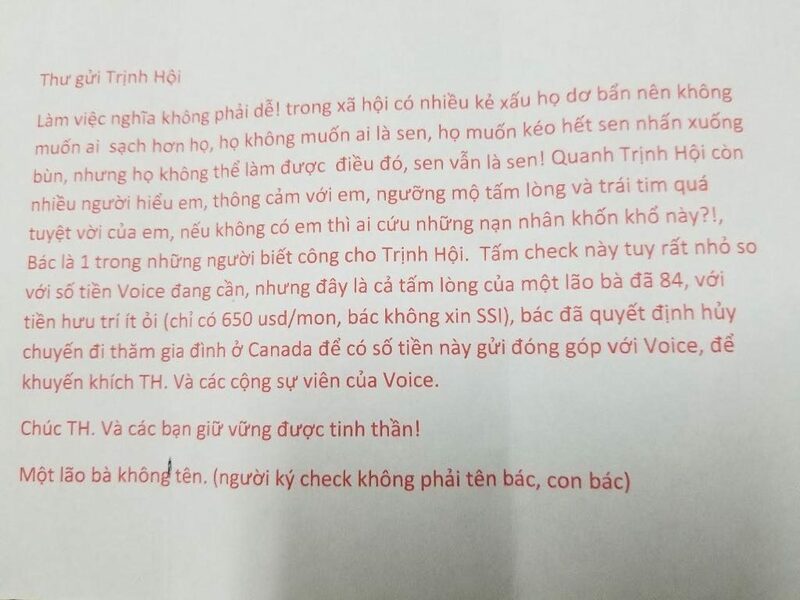 I decided to cancel my trip to see family in Canada so I could send this money to VOICE, to encourage Trinh Hoi and the work done by VOICE. I wish Trinh Hoi and all of you to keep up your spirits.